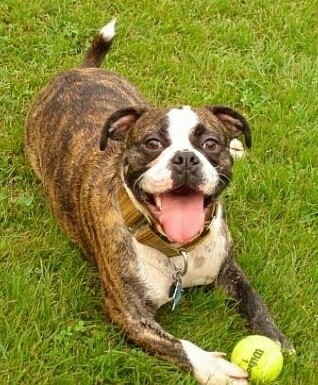 Django the Miniature Australian Bulldog at 1 1/2 years old loves his ball! The Miniature Australian Bulldog’s overall body structure should be one of great strength with good thickness of bone. Males should be solid and compact with good muscle tone. Nice long bodies on the females are preferred as a rule due to their being better whelpers than short-bodied females. A nice level topline is preferred, with tail cartridge straight off the back. Tail can be docked or not. Moderate turn of stifle and hock angulations. Chest area should be broad with the brisket well let down. Front to be straight with good shoulder placement. Body coat preferred short and smooth, not thick or rough. The head structure of a Mini Aussie Bulldog is one of its main attributes, being very strong and square in appearance having good depth and width of muzzle with a pronounced stop between the eyes and have 1/3 folds of wrinkle across the nose. Eye placement to be wide apart being large and clean in appearance. Mouth to be up to 1/4 inch undershot but breeding toward a near-level bite preferred. Teeth to be of good size and well placed within the mouth. Jaw structure preferred wide and square top and bottom. The Mini Aussie Bulldog comes in a variation of wonderful colors: shades of fawn, apricot, orange, red, mahogany, white and at least 5 shades of brindle including red brindle, fawn brindle, black brindle, mahogany brindle, silver brindle. Aussies also come in pied coloring with pied being one color more dominant than the other, with an arrangement of patches on the body that is quite appealing. The Miniature Australian Bulldog is being developed as a smaller version of the Australian Bulldog. He loves being part of a family. The Mini Aussie Bulldog is intelligent, loving and loyal with a sound temperament. Good with children. Fun loving, this breed is pretty easygoing. It will enjoy playing with a ball or Frisbee and loves to play or swim in water. Good watchdog, but not a guard dog, though its appearance can be a deterrent. Given the alertness of this breed, the Mini Aussie Bulldog does have the ability to be a dependable watchdog at a mature age. With its intelligence and loyalty this is a very easy dog to teach at home, but obedience training is recommended (as with any breed of dog). The Mini Aussie Bulldog has stamina, a very sound temperament and has not been known to show any aggression problems that are uncontrollable. The Mini Aussie Bulldog strives for affection and comfort from their owners and family members. Like all dogs, the Mini Aussie Bulldog needs an owner who is calm, firm, confident and consistent; setting the rules the dog must follow and sticking to them, along with providing daily pack walks are essential in preventing behavior issues. Weight: The weight is not specified, but it should be in proportion to the size. Although the best has been done to eliminate health problems within this breed, this does not mean that they are faultless, but all effort is put in to breed Mini Aussie Bulldogs of good health, sound structure and good nature. Miniature Aussie Bulldogs are not recommended for apartment life. This breed is an indoor dog, and should not be left outside all day in a kennel. Mini Bulldogs do best in temperate climates, as the breed can chill easily in cold weather and have trouble cooling off in very hot weather. Mini Aussie Bulldogs need plenty of exercise. They need to be taken on a daily walk. In addition, they like to go swimming in summer and lie in the sun during the winter months. Mini Aussie Bulldogs have more energy than their full-size Australian Bulldog relatives, particularly the females. They should get plenty of daily exercise. The Miniature Australian Bulldog is being developed by Mrs. Pip Nobes and Mrs. Lee-ann Milton as a smaller version of the Australian Bulldog. They took a full-size Australian Bulldog and crossed it with the Pug and French Bulldog. In the beginning of their breeding, they considered using the Boston Terrier and the Staffordshire Bull Terrier, however because of the temperaments of these two breeds, the idea was scrapped. The goal was to create a healthier version of the English Bulldog. "This is my 5-month-old Miniature Australian Bulldog Django. I got him from a breeder in Australia. Despite the serious stare in one of the photos (see below), Django is a comical dog, so full of personality and a zest for life. Just like an English Bulldog, he loves to cuddle and play. He is equally social with people and dogs and fearless—often "working" the dog park so that when another dog's owner throws the ball for their dog, he will use the opportunity to get a free petting from the owner, then lie in wait for the returning dog and chase him down to steal the ball. He can be very naughty, whether it’s stealing laundry and shoes and making his "mom" chase him to get them back or lying on his back with a toy between his paws and barking at it. He has learned quickly, and responds well to praise and a nice but firm tone of voice, but gets rebellious and defiant with more dominant tactics. Unlike the English Bulldog, he has no breathing difficulty, but does get overheated. He is reluctant to take his walk when the temperature exceeds 85° F, often throwing himself to roll around on the cool, shady grass. Though extremely easy going, he can be quite stubborn when he doesn't see the point. He is a great dog for people who like the English Bulldog, but desire a dog that is more active. Sometimes his level of activity makes him a handful, but he keeps me laughing."